Being outdoorsy is hard for some people. After selling most of our stuff, packing up the station wagon and hauling ourselves to a new life in Alaska I’m, well, over it. I’m outdoorsed out. I want to sit in this recliner and do nothing but watch Netflix and drink coffee for the rest of my life. It’s probably my own fault that this happened. Why I thought you could rip a typical indoor girl out of her house, parade her across the country on a one month on-again, off-again tent camping excursion and then drop her in Alaska to sleep in an empty house on a camping cot for three weeks with exactly zero ramifications I do not know. But you can’t do that. You’ll rip the outdoor desires right out of her and replace them with pajama pants and this chair. The view from this chair. If you spend more than 45 seconds in Alaska in the summer, you’ll hear someone note how crazy busy everyone here is during this season. People here embrace summer like it’s the last time they’ll see the sun for months …. because it is. Every single day starting in mid-June the Anchorage area loses just over four minutes of daylight. That means that although it’s basically light for 24 hours in June, by late August the sun sets at 9:30 p.m. and comes up at about 6:30 a.m. By September 30, the sunsets at 7:30 p.m. and comes up at 8 a.m.
On the shortest day of the year, you’re looking at just over five hours between sunrise and sunset. Five. Hours. This guy? He’s talking about Alaska. So yeah, Alaskans have a fire lit under their rears in the summer to soak up every single daylight moment outside. And nobody is even a little impressed that you camped your way across the U.S. and Canada (minus those tiny Motel bad weather incidents). They think you’re crazy that you’re not taking an evening hike after work every single night of the week. And still here I sit. I feel like I need an outdoor reintegration plan, something to push me back into the great outdoors before it’s too late and my choices are being very cold or sitting in this chair. So today? Today we are going hiking — rain or shine. Today we are going outside the gym, away from my comfy road running and into something more wild that will require bear spray (but really). I wanted to take a picture of the moment we decided where we are going when we leave it all and start our lives over this summer. But things don’t always work out how you planned, especially when it comes to big new life adventures forward. I’m guessing that’s a lesson I’m going to get a lot now. Instead, at the moment we decided which far away place we will head to when we start our lives over on Memorial Day, Luke was driving, and I – well, OK, I was crying. The relief that came with the decision, contained in an email from Luke’s future graduate school, was overwhelming. So instead, I took this picture when I stopped crying and Luke stopped driving. About three minutes after deciding where we are going to move. Dazed and relieved, much? We’re moving to Anchorage, Alaska. Why? Because plenty of people say things like “wouldn’t it be nice if we could leave it all and start over?” But few actually do it. When we decided to take a weekend kid-free vacation within driving distance of our Middle Tennessee home, we were looking for somewhere cheap but indoors to stay. I promise we’re not wussy — it’s just really cold out there, folks. Mammoth Cave National Park, Kentucky is within a few hours of our home, and since we’ve never had a chance to explore its many hiking trails, we picked that as our destination. Nearby Rock Cabin Camping seemed to fit the lodging bill, especially after we found that the National Park’s on-site lodge is currently closed for renovations. The small private campground is just a few minutes from the park’s entrance, and about 10 minutes from the visitor center. It has both campsites and a series of small, historic cabins. Owned and operated by a Navy veteran, the places seems quite rundown when you first drive in. But first impressions aren’t everything. We stayed in Cabin 3, and paid about $55 for the night. The cabin and linens were clean. The owner, Ralph, was very kind and accommodating. Weekend bookings at Rock Cabin Camping require a two night reservation, and we had booked to stay Friday and Saturday, but were unable to get there for the first night. We called and let him know we wouldn’t be checking in until Saturday. When we arrived — well before the daily check-in time — he only charged us for one night, although we were more than willing to pay for both. They were no where near full, but it was still very kind of him to cut the cost of our stay in half. So what did we think? Here’s our review. It wasn’t an impulse decision. I am not the kind of person who gets tattoos. I’m not entirely sure what kind of person that is, actually, but I never counted myself as one of them. I never thought there was anything wrong with them, per se, and I deeply admire a whole bunch of people who have many of them. I’ve just always said it wasn’t for me. Why would I want something that I couldn’t get rid of? 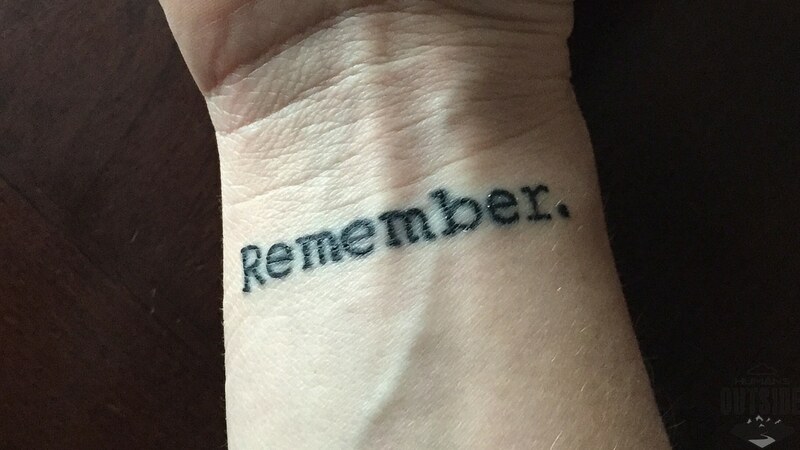 And yet here I am: a fairly permanent decision made, a word inscribed in a visible place on my arm — a constant reminder. We told you that we’re getting ready for a big adventure forward. We told you that we are selling everything and moving ourselves across America. And you wanted to know: how do we make money off our unwanted stuff? Let’s skip to the end of the story right away: things that don’t sell or aren’t worth selling get hauled to the Goodwill. Everything else? We make an attempt at earning some cash. So how do we do it? It takes some work, but it’s not impossible. Here’ how. But first, know this: you have to plan ahead. Unless you’re going to just have a massive yard sale and then donate everything you can’t offload, selling stuff takes time. So start now. Yes, now. There are a ton of links to options below. Never miss a post from HumansOutside! Sign-up for our mailing list today. Thanks for visiting!! Why not like our Facebook page or subscribe below to future posts?